It was not the first terrorist attack in Europe. Madrid and London came first. It wasn't the first time that cartoonists in Europe were the target of terrorists. Denmark was first (see 'Birth chart of a cartoonist in danger'). The attempt to kill free speech in Europe started with Salmon Rushdie. After the brutal murder on Theo van Gogh (see post), threats for not welcome plays, movies or expositions in the eyes of islamists, anxious political correctness and the coming up of IS, it was quite clear that more was to come. Is it strange that now that Saturn entered Sagittarius, that this limited freedom of speech is the issue today? In France, there were a number of attacks (some with cars) before, and the authorities stated that the men who committed these crimes were isolated lone wolves with psychological problems. Maybe the two brothers could be considered insane as well. They think that hurt feelings - when their religion is involved - are a license to kill. They believe that their religion allows or even supports this and I am afraid that there are a couple of thousands like them. Here you see the charts of the moment of the attack with (in transit) the positions on the days of birth of the two murderous brothers. It seems that their parents left them at a very young age. In the chart of the brothers, Sun-Uranus (major and minor aspect) tells us about possible alienation. They sure isolated themselves in the eyes of the majority, on January 7. I wish that I was brave enough to be Charlie. I am not. I am anonymous and I always weigh my words carefully in spite of my Mercury opposite Uranus, because I am aware of the dangers. There is already such an amount of political correctness and fear in Europe, that in my opinion, freedom of speech has house arrest and will have to be strong to defend itself. 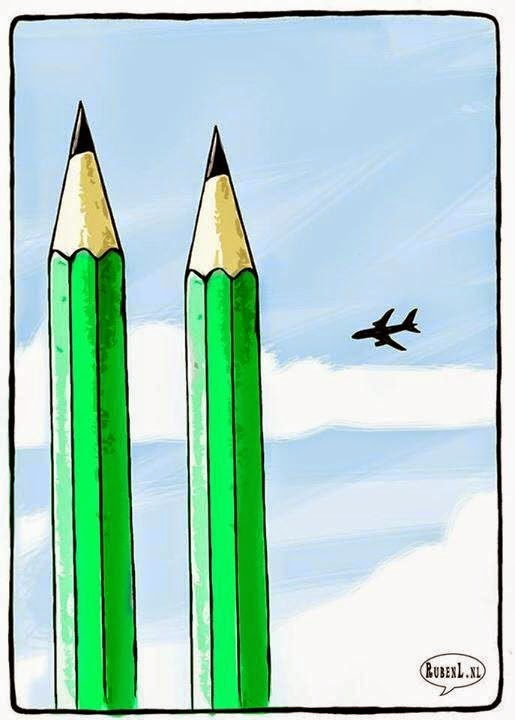 The CharlieHebdo crew must have (had) special courage and special drives to dare to shock (and amuse) their public. It is in the nature of a cartoonist to walk on the edge, always. But it's only in the last decades that this might cost them their lives. This attack fuels the already existing tension in Europe. Politicians are afraid of what will happen next and hurry to tell us that we must not be scared. Paris is far far away? Life went on after 911, after London, after Madrid and nothing much changed except that columnists, cartoonists, cabaretiers and journalist have more and more turned to political correctness, because they love life. Let's hope, that just like in the books of Tolkien, the monsters will be defeated and we can all go back to our garden of flowers as usual, until the next attack. Will we have to get used to this, like in the Middle East, in Nigeria, in Syria? Does this really 'awake' us? The sixties are past and gone. It seems like there is no more 'Age of Aquarius' (you know the song?) dawning (or has it started in March 2012, read this...). It looks more like a decline, to the same dark ages that hold the people of countries like Iran, Syria and Nigeria. It will be hard to turn the tides. I am still looking for positive signs for future peace (and I don't mean after being defeated). Have you found any? On March 16 Uranus will be square Pluto for the last time since 2011, but this doesn't mean that there will be no more tension and world peace danger after that. It won't be more, that is a fact. The spring chart (the astrological new year's chart) will still have Uranus-Pluto's square within a 5 degree orb and it will last until 2018 to finally fade away. Uranus-Pluto will hit the chart of Vladimir Putin again this year, but won't be exact in Barack Obama's chart. The crisis is getting less in the USA and stronger in Russia these days, in line with the leaders' charts. The charts of the NATO and EURO, however, show difficulties in February/March 2015. It will be tense in Europe. How about ISIS? I don't know. I hope that they will be defeated in the end, but when I see what happens with the Taliban in Afghanistan, I have my serious doubts that there will ever be peace as long as fanatics want us all to surrender as if we live in the books of Tolkien. http://www.xstarian.com/The-Future.html Saturn-Neptune:" ideologically based cruelties". "I wish that I was brave enough to be Charlie. I am not. I am anonymous and I always weigh my words carefully in spite of my Mercury opposite Uranus, because I am aware of the dangers." One needs to be safe.